No matter the background, ethnicity, religion, or political orientation, all men enjoy fishing to some extent. Some even spend long periods of time away from home on fishing trips with their friends or family, which is where all the fishing-related gear comes into play. Such is the case with fishing kayaks, which unlike regular kayaks, are designed to provide stability and maneuverability above everything else. After taking into consideration everything the market has to offer at this point in time, we put together a list of the ten best fishing kayaks money can buy. Equipped with two flush mount rod holder and a swivel rod holder, this kayak makes it easy for you to accessorize your gear. It also benefits from a large comfortable seating area and an open cockpit for easy access. Furthermore, this kayak features a spacious Portable Accessory Carrier (PAC) that can be used for extra storage, a tow behind, or a backpack. It also features a dry storage compartment and a shock cord deck rigging. Seemingly simplistic by design, the Lifetime Fishing Kayak has a 500 lbs weight capacity, which is impressive to say the least. It also allows multiple footrest position for different size paddlers thanks to its ingenious design. Speaking of design, this kayak also features a center carry handle for easy transport along with front and rear shock cord straps. Not only that but it also has a front T-handle for easy transport, a feature one must always look for in a kayak. This is one of the most popular fishing kayaks ever made and it’s easy to see why that is. Designed specifically for fishing, this kayak benefits from a performance-oriented hull that is fast, stable, and surprisingly quiet when sailed in rough waters. It also benefits from a large front hatch with easy access to the bow and stern, a hatch that opens up an impressively large storage area that accommodates multiple rods with relative ease. This exquisite fishing kayak may be a bit pricier than most but with good reasons. It features a large covered bow hatch of the highest standard, one that will withstand a lot of abuse before showing signs of damage. It also features a sail mount that you can use freely with no restrictions to speak of. Thanks to its ingenious design, this kayak allows you to sail it at roughly the same speed both ways, a versatility facilitated by a comfortable vantage CT seat. What makes this particular kayak stand out is the fact that it costs only a third of what other fishing kayaks cost. This doesn’t mean that it lacks any important accessories, quite the contrary. This kayak comes with an airtight system to prevent leaks, a tarpaulin bottom to provide durable protection from punctures, double lock valves for easy inflation/deflation, a secure storage area, carry handles, cup holders, a paddle, and an included hand pump to top it off. Like the name suggests, this fishing kayak can accommodate two people comfortably, which isn’t a feature that many fishing kayaks have. It also benefits from a 1,000D tarpaulin bottom with an 840D nylon cover for added protection from punctures. At the same time, this kayak benefits from a multi-chamber construction that allows the kayak to stay inflated even after it gets punctured somewhere along its entirety. Due to its ingenious design, this particular kayak offers an optimal maneuverability when tracking and turning. Two flush mount rod holders ensure that your rods will always be secured regardless of how much the kayak moves while a swivel rod holder to take the weight off having to handle the rod in motion. Interestingly enough, this kayak also features a storage hatch with shock cord rigging along with a large open cockpit with an adjustable seat. It is the large open cockpit that recommends this durable kayak, one that features an adjustable padded seat with a high back support. Construction-wise, let us point out that it enjoys a rugged UV-stabilized Fortiflex High-Density Polyethylene construction that makes it particularly strong. It also features a convenient gear storage compartment with shock cord deck rigging to help you through. Furthermore, this kayak comes with adjustable foot braces, carrying handles, and a water bottle holder for good measure. Few fishing kayaks offer the spacious interior that the Sea Eagle Se370K has, a kayak that stands out not only through its unique construction but also through its affordable price. Despite its affordability, this kayak is 100% NMMA certified and can be inflated in no more than 8 minutes. It is also built to hold up to three people at the same time, thanks to its 650 lbs weight capacity. Combine that with two carry handles, self-bailing drain valve, five one-way valves, and two skegs for better tracking, and you begin to understand why this particular kayak enjoys its current popularity. There is perhaps no better fishing kayak than the Intex Explorer K2 when it comes to convenience and affordability. This two-person inflatable kayak measures 20 x 36 x 123 inches in size and comes equipped with aluminum oars and a high output air pump. As for the kayak itself, it enjoys a directional stability like no other thanks to its removable skeg feature. We should, however, point out that the K2 was made for smaller bodies of water like lakes and mild rivers. Presuming that you’ve already taken the time to educate yourself on the matter of kayak fishing and what it’s all about, all that remains is that you find a suitable fishing kayak for the job. Unless you have extensive knowledge on the subject, choosing the right kayak might prove a bit of an inconvenience. One thing to remember about kayak fishing is that it is unlike boat fishing, both in terms of maneuverability and stability. Set up some goals – It is important to be honest about your perspectives when choosing a kayak because chances are that you won’t be using the kayak too often. In this regard, first figure out the body of water you will be using it on. This is because fresh water fishing differs from salt water fishing, just as much as farm ponds are different than huge lakes. So unless you’re planning on going ocean fishing any time soon, then perhaps you should invest in a smaller, fresh water kayak. 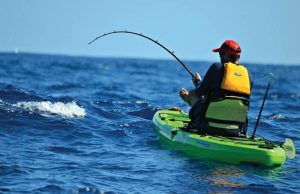 Speed or stability – Another thing to consider when buying a fishing kayak is whether speed is your primary concern or if you’d rather have a more stable one. While longer kayaks are usually faster than the short versions, wide kayaks are much more stable when sailing calm waters. You should also keep in mind that kayaks sometimes have rocker bows which allow them to perform better in wavy conditions but not on flat water. Choose a type – There are two main types of fishing kayaks to choose from – inside and on top versions. Like the terms suggest, inside kayaks sit the rider inside the actual kayak whereas on top versions require that you stand on top of the actual kayak body. For this reason, most people prefer ‘cockpit’ styled kayaks that are larger in size and more comfortable overall. We should, however, point out that ‘on top’ kayaks are usually much more lightweight and faster in terms of sailing speed. Do your homework – It may seem like such an intuitive thing to do, yet some people are under the impression that they’ll just pick things up as they go. In reality, you should always consult an expert of sorts, or at least someone who has experience using kayaks. If possible, visit a local kayak shop and ask whatever question you might have regarding how kayaks are supposed to be handled and what maintenance they require. As a matter of fact, you should perhaps take a test paddle or hire a guide to help you through. Storage and transportation – One should also consider the issue of storage when buying any piece of large equipment and kayaks are definitely difficult to store. Unless you’re buying an inflatable kayak, you might find yourself in the position of having to move things around the house just to accommodate such a large piece of equipment. This is also the reason why you might find a kayak difficult to transport, especially if you drive a small car. The best thing to do is to ask the vendor for a solution because they usually have ways to accommodate your needs. Looks matter – Unless you’re using the kayak in a pond behind your house, chances are that people are going to gaze at it to some extent. 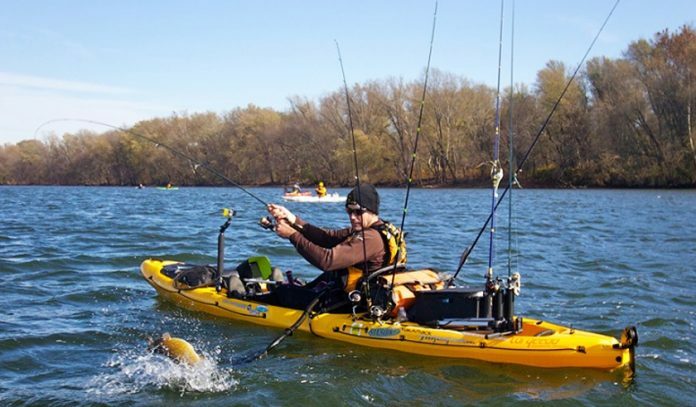 Although it isn’t exactly an expensive sports car, a fishing kayak is still going to draw people’s attention, especially when you’re carrying it to or from your preferred body of water. As far as aesthetics go, you should perhaps invest in a cool looking kayak, just as long as it doesn’t affect its general performance. The seating – If you have chosen a sitting kayak, then by all means, make sure that it features a comfortable seat. Given the very nature of fishing kayaks, it would be safe to presume that you will spend an awful lot of time sitting in it every time you take it for a spin. Now, we should point out that different models have different types of seats, varying from extremely comfortable with high back support to simplistic padded seats. Depending on your budget, you might find yourself in a position to choose between practicality and comfort. The paddle – The paddle is perhaps the second most important piece of equipment any kayak user can own beside the PFD (personal flotation device). A good paddle will enable you to gain speed and mobility in any body of water. It may also make the difference between life and death should you ever find yourself caught out in the open when the weather takes a turn for the worse. While your local dealer may recommend a number of paddles for you to choose from, most riders agree that you should always go for the lightest version you can find. Safety – Last but not least, always make sure that you’re 100% prepared for everything that could go wrong. Like we said, a PFD is absolutely required, no matter what body of water you might be paddling on. As a matter of fact, there are many types of PFDs to choose from, each designed to fit a certain set of needs and requirements. For the most part, these PFDs are comfortable and highly functional. Comfortable in the sense that they won’t impede your movement and functional in the sense that they have storage pockets for you to use.